The workshop has been completely reconfigured and renewed. Please read the blogpost to see pictures of the new shop. The workshop occupies a section of my finished basement (which we usually refer to as a ‘cellar’ here in New England). Some of the inspiration for my workspace comes from visiting and reading a lot about Colonial Williamsburg (the colors, the wainscoting, etc.) and some of the figures who are inspirational to me. You can see a large map of the world over the bench. And to the right in the corner are photographs of V. V. Andreev and S. I. Nalimov, master balalaika makers. There are a few instrument maker’s plans, forms and jigs hanging on the walls as well. 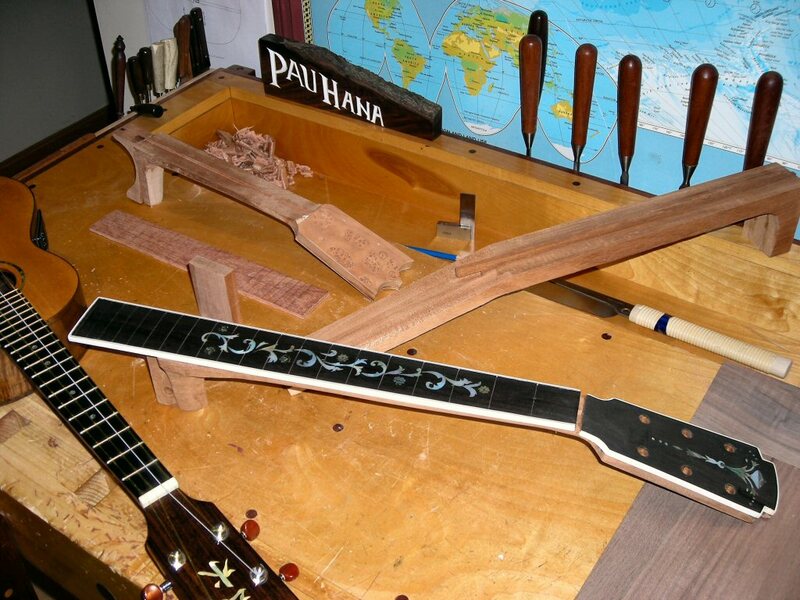 To the left of the workbench is a photo of Samuel Kamaka who provides the appropriate watchful eye over the ‘ukulele building activities in this workshop. This workshop is still (constantly?) a work in progress and I keep putting certain projects aside and spending a little time working on the workshop itself. It was originally located out in the garage, but I eventually decided to move into the basement from the garage. So far it’s a really comfortable place to spend time. I recently added a Shaker Clock I built from a plan in Popular Woodworking. I thought it was finally time to keep some track of what time it is in the shop! When I started this project I had a junky old plywood and 2×4 bench left behind by the previous owner of the house. It was clear that I had to get myself a proper bench (see below) if I was ever going to get serious. I read an article several years ago in American Woodworker on how to build a solid bench for a “buck a pound”. 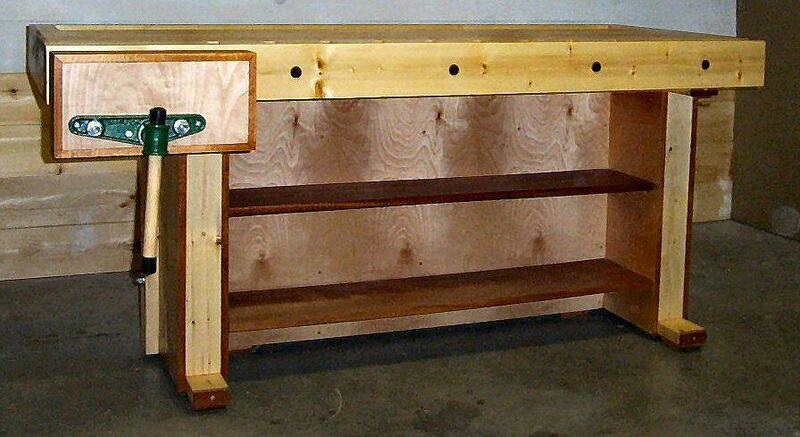 I saved it and thought that if I was ever going to build myself a new workbench, it would be the one in the article. Of course, I felt the need to upgrade it considerably. It was spec’d to use regular AC plywood, but I instead decided on using Birch furniture grade plywood. I also used a lot of plugs (birch and mahogany) to fill all of the screw holes and was careful to align all of the holes so that the plugs would make a striking effect when it was ‘finished’ with an oil/poly coating. I was fortunate to have a large pile of mahogany given to me by a friend, so I used it to trim things out and it really made a difference in the overall appearance of the bench. I was very pleased with the bench and it probably came out to be more like $1.50 a pound when all was said and done. I ‘think’ it weights about 250 lbs. Of course, this was all before Chris Schwarz’ books and articles started appearing about workbenches, especially the Roubo. I think there is a Roubo bench in my not too distant future. In addition to working on ‘ukuleles I have spent some time reconstructing a Balalaika Project (The Perestroika project) and a couple of old Neapolitan bowl-back mandolins. I also completed a violin (fiddle) for my daughter. Over the past few months I have been completely redefining and updating my workshop space. And voilà, a whole new shop! See the complete post.